food – What's Cookin' @ Special Collections?! The majority of our staff was off at a conference last week and I, for one, took advantage of a great food scene. 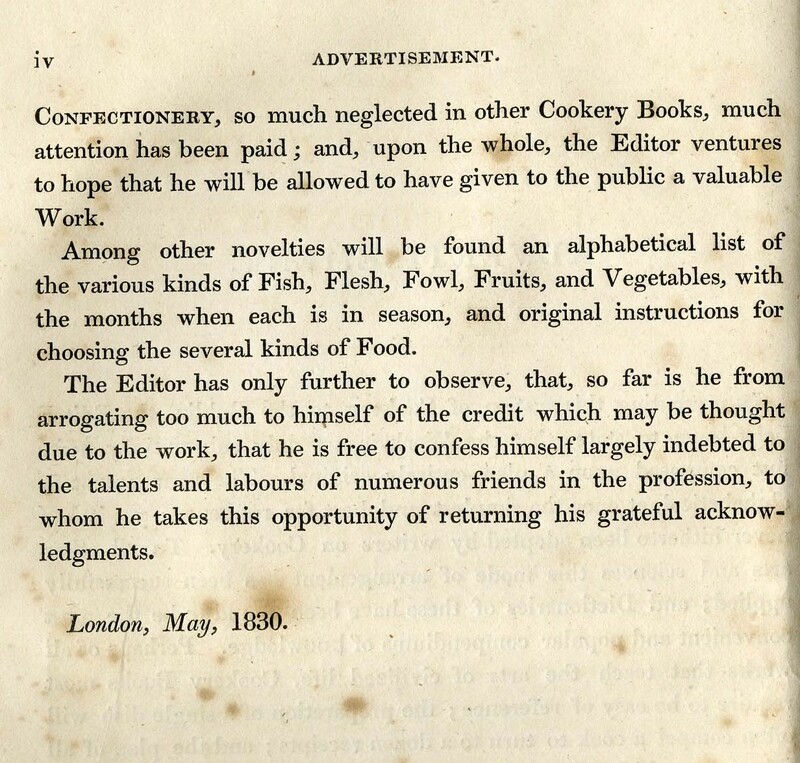 Playing catch up hasn’t left me with too much time to ponder a feature this week, but I thought I’d take a few minutes to post updates on some resources from Special Collections on the topic of food & foodways research. Since I last posted a link to these resources back in January of 2017, I’ve added at least one more. The “Food & Drink History Resources @Virginia Tech” resource guide was created back in 2014 and there is a previous blog post about it. Since then, I’ve made period updates to content, fixed links, and tinkered a little bit with the layout, but it’s largely the same guide and serves the same purpose as when it was first created. After that, I created a guide for the materials relating to infant, child, and family nutrition. This was partially to highlight this group of materials AND partially a response to a class I was working with at the time. It includes information about the collection, how to locate books and manuscripts in the collection, and some suggested online tools and resources. Of course it didn’t take me long to get into the cocktail history materials, either. The guide for this group of materials is organized by time period and highlights some of the significant “eras” of cocktail culture in America. Each section includes a short introduction and a list of suggested resources. I’ve also put together some more general cocktail history and online tools. Last (for now! ), but certainly not least, at the start of this year, I put together a resource guide for the Introduction to Appalachian Studies course offered at Virginia Tech. It includes a breakdown of Appalachian resources by format and topic. One of the major sections is dedicated to food & foodways. It contains suggested resources in Special Collections relating to food items (i.e. cookbooks and research on food), as well as books about traditional folk medicine, farming, and agriculture. It’s a little bit broader that “just” food, but it’s another helpful place to collate information! I’m still working on the latest guide, which will focus on aspects of food technology and production. I’m looking forward to getting it completed (or at least enough of it to go live), since this will talk about some other aspects of food history not covered in the same detail on other guides. This will include aspects of food technology, agriculture, food science, transportation of food products, manufacturing, advertising, and more! So, if you’re doing any summer research on food, some of the resources above might help you out! The majority of the content covers print and manuscript materials housed in Special Collections, but most guides also contain some online resources, tools, and digital collection you can access wherever you are! Also, in the realm of manuscript collection updates, just this week, I processed the remaining backlog of the Ann A. Hertzler Collection. The finding aid has been updated and it includes materials donated by the late Dr. Hertzler in 2014: research and subject files on foods and people in the culinary history world, as well as several small boxes of magnets and other small artifacts. We moved of the digitized items that weren’t from Cooperative Extension to the same platform and updated the links. Digitized items from her collection are online via the Special Collections website. Digitized Cooperative Extension publications authored or co-authored by Dr. Hertzler are available through the university’s institutional repository. I’m thinking about a post for this week (welcome to 2017! ), but in the meantime, something awesome happened this morning. Through the power of social media and happenstance, I discovered a resource I didn’t know about (but really should have). It relates in part to food, drink, agriculture, cocktails, medicine and other aspects of Appalachia, so I though I’d give a shout out to the great work of the folks at JMU! What is this amazing collection? The Shenandoah National Park Oral History Collection! There’s a page for the collection, that includes short summaries of interviewees/topics, along with transcripts and audio files. And for those of you who love a finding aid, there’s a larger description of the collection, too. Whether you’re interested in food preservation, education, or folk life, you might find something about Appalachia you didn’t know before! This pamphlet for “Eatmor Cranberries” (seriously!) puts cranberries in baked goods, sauces, salads, relishes and even–yup, you guess it–gelatin! It has tips for using cranberries as a meat tenderizer and a recipe for cranberries as an omelet filling. It also includes a little bit of detail about where the berries come from and how they are harvested. Although our last example (below) contains a lot more detail on the history of cranberries. But first, “Cape Cod’s Famous Cranberry Recipes” (1941) from the National Cranberry Association. This organization was also known early on as the Cranberry Canners, Inc., but most of you will probably recognize it by the company’s current name: Ocean Spray Cranberry, Inc. This pamphlet includes many of the expected items, but it also has “Cranburgers” (hamburgers with a cranberry sauce), a range of desserts, and some punches and cocktails. At this rate, you could work cranberries into every course of your Thanksgiving meal. Or your everyday meals, really. So, however you enjoy them, sneak some cranberries into your holiday. You won’t regret it! This week in our summer cooking school series, we’re taking a step back to the basics, encyclopedia-style! But don’t worry, it’s not just for grocers! This encyclopedia is packed with dictionary-definition terms and history, multi-lingual lists of foods, and black & white and full color illustrations. While it would certainly be useful for those in the food trade, it’s just as useful for the home cook who might be encountering something new or who wants to learn more about a common ingredient. In addition to the strictly A-Z listing of grocery-related foods, the encyclopedia also includes 7 appendices. These include a 5-language “dictionary of food names,” short foreign language-to-English dictionaries (French, German, Italian, and Swedish), a list of culinary and menu terms, and a weights and measures table. Sample page from Swedish-English dictionary of foods. The entire encyclopedia is online through Special Collections–all 748 pages of it! (We could barely begin to represent it here.) Sure, it may not have EVERYTHING, but between abalone and zwetschenwasser (the German name for “slivovitz,” a European liqueur made from plums), there’s quite a bit to discover. What’s in the (Sugar) Bag? This week, I thought we’d take a look at a “shaped” publication. (Also, I have plans to recreate an 1827 “Layfayette Gingerbread” recipe this weekend and I have sugar and molasses on the brain.) As we know from the wide array advertising materials we’ve looked at before, companies have all kinds of quirky strategies for attracting consumer attention. This booklet from W. J. McCahan Sugar Refining & Molasses Co. took a novel approach: they shaped the publication like a bag of sugar. “McCahan’s Sunny Cane Sugar” was published in 1937, but as you can see from one of the images above, this was far from the first edition. The 88 pages are packed with information on the history of sugar, types of sugar produced by the company, recipes, and kitchen/cooking tips. The recipes primarily provide instruction for desserts (not surprising), but there are also sections for meat and vegetables. Because of course you’ll want to get sugar into every dish of your meal! First up, The Encyclopedia of American Food & Drink from 1999. Next, The Encyclopedia of Food and Culture, 2003. As you might notice, none of these volumes cover topics in quite the same way. The Encyclopedia of American Food & Drink includes hundreds of recipes scattered among its pages. The Encyclopedia of Food and Culture takes a broad, global look at food and its connection to general culture. And The Oxford Encyclopedia of Food and Drink in America focuses on food/drink items, technology, history, advertising, and more. These approaches are a good thing that reflect the multiple approaches many scholars take to doing research. Some are more comprehensive that others, but they all offer different perspectives on the foods and food cultures that play such important roles in our lives. July is also National Baked Bean Month, National Bison Month, National Grilling Month, National Hot Dog Month, National Ice Cream Month, National July Belongs to Blueberries Month, and National Picnic Month. July 18 is also National Cavier Day. I promise, I don’t make these things up! There are SOOOO many fun food holidays to know about! 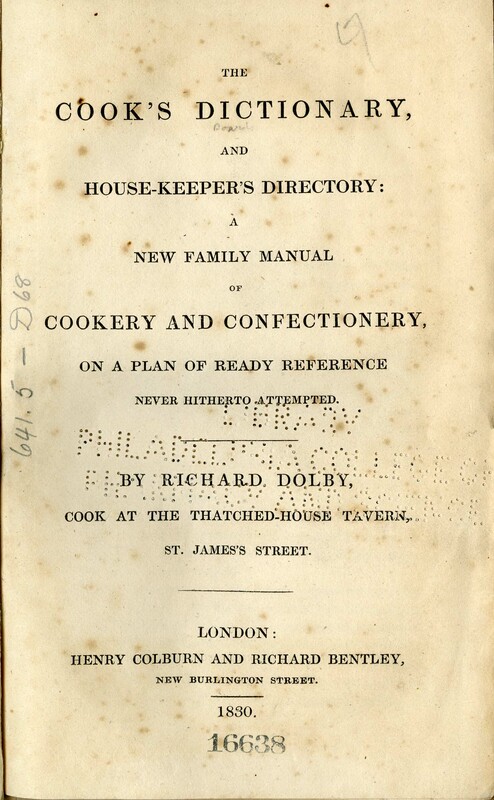 In 1830, Richard Dolby, cook at the Thatched House Tavern in London, wrote something “never hitherto attempted.” One might spend quite a bit of time pondering what Dolby produced that, in his own words, seemed so groundbreaking in the culinary world. It wasn’t a recipe/cook book (well, not exactly). It wasn’t an encyclopedia of food history (well, not exactly). And it wasn’t a guidebook for young housewives (well, not exactly). 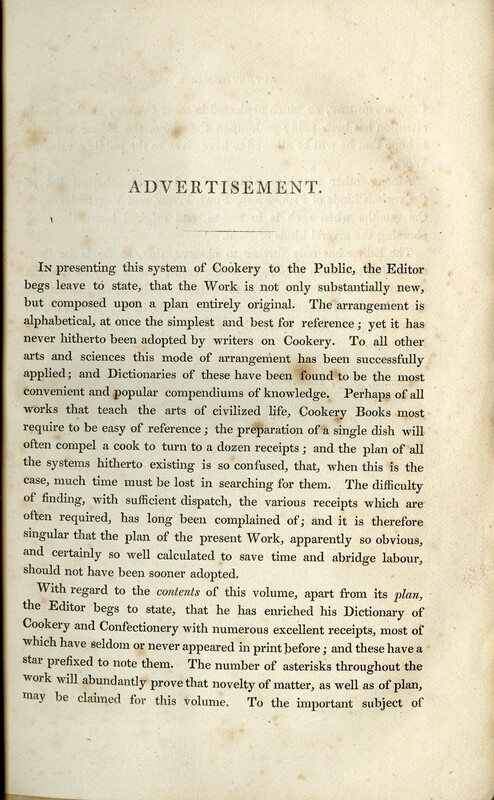 It was, however, The Cook’s Dictionary and House-Keeper’s Directory: A New Family Manual of Cookery and Confectionery, on a Plan of Ready Reference Never Hitherto Attempted. The meat of the book (pun intended, of course!) is an alphabetical listing of foods, food groups (classifications of recipes, rather than what we might think of as contemporary food groups), and recipes that are representative of foods. Even when an entry blends all three, it is provided as a straight narrative, recipe included, which is characteristic of many pre-20th century cookbooks. Nor does Dolby abandon his readers after he finishes the “Zs.” His leaves us with two helpful additions: One, a short list of terms used throughout the book, and two, a calendar year list of when certain foods are available in season. While the latter may not be accurate today, nor overly helpful outside the UK, where growing seasons may differ, it’s easy to see how they could be useful to readers in 1830. You can find the full text of Dolby’s dictionary online here. If you’re curious to see what he included, it’s very much worth the look. Plus, it’s in alphabetical order, so there’s no difficulty in finding an ingredient!